Color, purple. 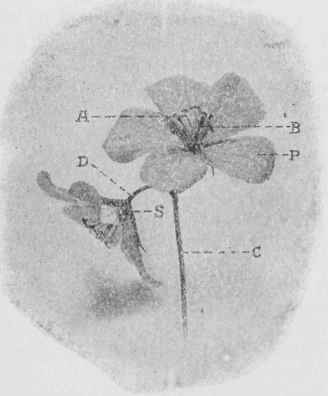 Parts of the flower in fives. Stamens, 10. In this species the peduncles are longer than the leaves. Stems, slender, somewhat weak, hairy. Leaves, 1 inch or more in diameter, very deeply cleft into 5 to 7 divisions, the segments cut into narrow, irregular lobes. Petioles, slender, those from the base 5 to 6 inches long. Flowers, in pairs, on long peduncles springing from the axils. May to July. In fields and edging roadsides, from New Jersey and Pennsylvania southward.